If Obama is not elected Tuesday, I’m going to pack my, my husband, and doggie’s stuff up into a bandana and tie it onto a stick and hop the next train to Canada. 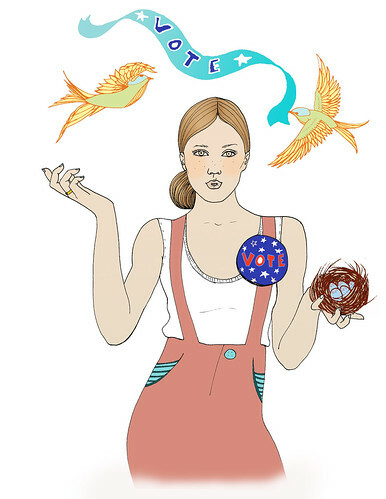 This “Vote” illustration is in the November issue of Glamour Magazine. Here’s the post with the other illos I did for that issue. Might have to move on to Glamour Canada. 4 Responses to VOTE! gOBAMA! Yippee! I love this. I’ll be joining you in Canada as well if Obama doesn’t win. But it looks promising. I can’t help but hope!!! Yas and Chelsea….we’re going to vote right now….it’s still dark…..I’m with you girls!! the voter turnout was incredible. Got to the polls before 6, waited on line for 30 minutes outside and then again for 15 minutes inside to vote! It was a really great energy. Going to an election party tonight. Hopefully will be crying with joy by bedtime! !